On June 9 the Germans attacked the Montdidier-Noyon front in an effort to widen the Marne pocket and bring their lines nearer to Paris, but were stubbornly held by the French with comparatively little loss of ground. In view of the unexpected results of the three preceding attacks by the enemy, this successful defense proved beneficial to the Allied morale, particularly as it was believed that the German losses were unusually heavy. 15. 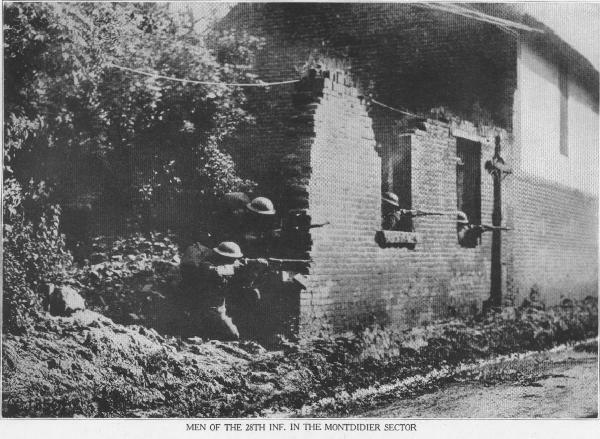 On July 15, the date of the last German offensive, the First, Second, Third, and Twenty-sixth Divisions were on the Chateau-Thierry front with the Fourth and Twenty-eighth in support, some small units of the last two divisions gaining front-line experience with our troops or with the French; the Forty-second Division was in support of the French east of Rheims; and four colored regiments were with the French in the Argonne. On the Alsace-Lorraine front we had five divisions in line with the French. Five were with the British Army, three having elements in the line. In our training areas four divisions were assembled and four were in the process of arrival. The Marne salient was inherently weak and offered an opportunity for a counteroffensive that was obvious. If successful, such an operation would afford immediate relief to the Allied defense, would remove the threat against Pans, and free the Paris-Nancy Railroad. But, more important than all else, it would restore the morale of the Allies and remove the profound depression and fear then exsting. Up to this time our units had been put in here and there at critical points as emergency troops to stop the terrific German advance. In every trial, whether on the defensive or offensive, they had proved themselves equal to any troops in Europe. As early as June 23 and again on July 1O at Bombon, I had very strongly urged that our best divisions be concentrated under American command, if possible, for use as a striking force against the Marne salient. Although the prevailing view among the Allies was that American units were suitable only for the defensive, and that at all events they could be used to better advantage under Allied command, the suggestion was accepted in principle, and my estimate of their offensive fighting qualities was soon put to the test.